Renewable Electricity – The goal is to provide all electricity from renewable sources through pioneering integration of photovoltaics, energy storage and management techniques, while leveraging SFPUC’s clean energy portfolio. Natural gas- and oil-fueled heating will drop sharply. 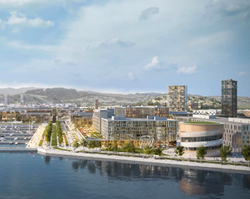 HVAC Savings – The SF Shipyard’s technology approach will cut HVAC energy consumption by 68 percent, dramatically reducing environmental impact and saving 150 million gallons of water per year. For additional information please contact: David Yanni, Chief Development Officer - Dyanni(at)gienergyus(dot)com in California or Thomas Chadwick, CEO – tchadwick(at)gienergyus(dot)com in Chicago. http://www.gienergyus.com @gienergyus.